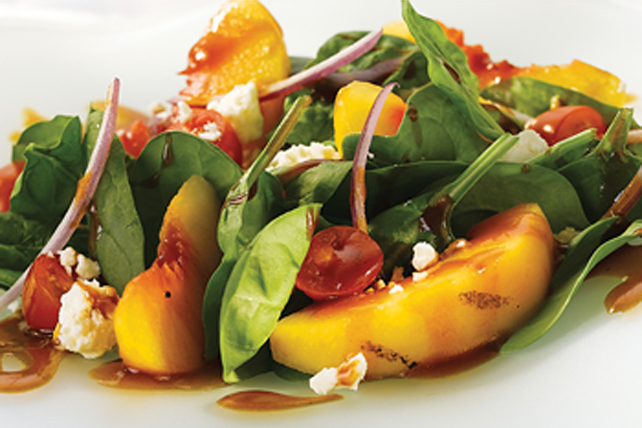 A beautiful and delicious salad anytime, but especially scrumptious when prepared with locally grown fresh peaches. Mix barbecue sauce and vinegar until blended. Mix half the barbecue sauce mixture with oil; reserve for later use. Toss peaches with remaining barbecue sauce mixture. Grill peaches 3 to 4 min. on each side or just until grill-marked on both sides. Cut peaches into wedges. Toss spinach, onions and tomatoes with reserved barbecue sauce mixture; top with peaches and cheese. This flavourful salad can also be prepared with canned peach halves. Drain peaches, then pat dry with paper towel. Grill 2 min. on each side, then cut into wedges and use as directed. Substitute baby arugula for the spinach and/or Cracker Barrel Crumbled Feta Cheese with Oregano, Sun Dried Tomatoes and Black Pepper for the goat cheese.